Bags are made from various materials, but the most common is woven polypropylene. They usually measure about 14 inches wide and 24 to 26 inches long. Other sizes of bags also are available, but bags are easier to handle if their weight with filling in them is limited to 35 to 40 pounds. Sand is the easiest material for filling and shaping sandbags. Silt and clay in bags will form a good dike, but working with those materials is more difficult. Fill sandbags slightly more than one-half full. Contact your county emergency management office for information on where to obtain sandbags. When selecting the location for the dike, take advantage of natural land features that keep the dike as short and low as possible. Avoid obstructions that would weaken the dike. Do not build the dike against a building wall due to the forces the dike may place on the building. Leave at least 8 feet to maneuver between the dike and buildings for observation, pumping seepage water and other activities. Since friction holds a dike from sliding, create a good bond between the ground and the dike. Remove ice and snow since it will melt permitting water to flow under the dike. Remove anything else that is “slippery.” If the dike is to be more than about 3 feet high, dig a bonding trench where the dike will be placed if possible. The trench should be about 4 to 6 inches deep and 18 to 24 inches wide. Estimated cubic yards of sand needed per 100 feet of dike length for various dike heights and ratios of height to width. An additional 2 cubic yards will be needed for bags to hold the plastic. This volume is calculated based on a center section that is 9 inches wide and the remainder is in a triangular shape. Build the dike at least 1 foot higher than the projected crest level to allow for fluctuations in the water level. Local experience will assist in determining the amount of freeboard to provide. The U.S. Army Corps of Engineers recommends building a dike with a width at the base that is three times the dike height. For example, a 4-foot-high dike would have a base width of 12 feet. The corps indicates that each foot of finished dike length requires one bag, each foot of height requires three bags, and each 2.5 feet of width requires three bags. This results in each bag having placed dimensions of about 4 inches high by 10 inches wide by 14 inches long. Use the following equation to estimate the number of bags required per linear foot of dike for a dike with a base width that is three times the height. Estimate the number of bags required per linear foot for a dike 3 feet tall. A common recommendation is to make the dike twice as wide as its height. This is a minimum width-to-height ratio that should be used. The estimated number of bags needed for this ratio is in the following table. This is based on each bag having placed dimensions of about 4 to 5 inches high by 9 to 10 inches wide by 14 inches long. Lift bags using your legs and limit twisting of your back. Gently hand the sandbag to the next person in a sandbag brigade or line. 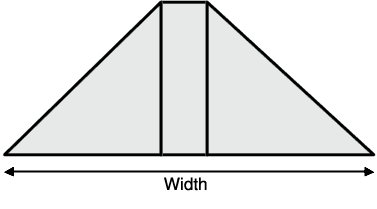 A triangular or pyramid shape for the dike is not necessary if the height will be 1 foot or less. 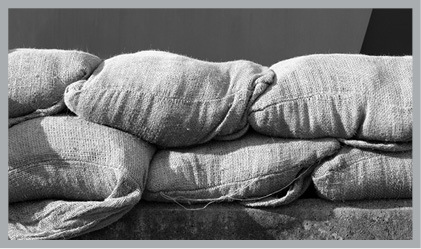 Support the wall of sandbags with “clusters” of bags every 5 feet to stabilize the sandbag wall so it does not tip over from the force exerted by the floodwater. Place the first layer of bags lengthwise on the dike (parallel to the flow), lapping the bags so the filled portion of one bag lies on the unfilled portion of the next, with the tied or open end of the bag facing downstream. Offset adjacent rows or layers by one-half bag length to eliminate continuous joints, similar to what is done laying bricks. Compact and shape each bag by walking on it to develop dike strength and create a tight seal. Continue to walk on the bags as succeeding layers are placed. The base of the dike should be about two to three times as wide as the dike is high to provide adequate strength and friction surface area. Water exerts a tremendous force against the dike. Estimate the pressure on the dike base by multiplying the water depth by 62 pounds. For example, the pressure that 5 feet of water exerts on the base of a dike is about 310 pounds per square foot. The force of 5 feet of water on a vertical wall is about 775 pounds per linear foot of wall. Flowing water striking the dike exerts even more force on the dike. A triangular-shaped dike permits the weight of the water to push down on the dike to help hold it in place. The finished dike should be sealed with a sheet of plastic to improve water tightness. Spread a layer of soil or sand 1 inch deep and about 1 foot wide along the bottom of the dike on the water side. Lay polyethylene plastic sheeting so the bottom extends 1 foot beyond the bottom edge of the dike over the loose soil or sand. The upper edge should extend over the top of the dike. Poly sheeting at least 6 mils thick is preferred. It generally is available in 100-foot rolls from construction supply firms, lumberyards and farm stores. Do not put plastic sheeting under the bags since that will increase the potential for the dike to slide. If more than one sheet of plastic is used, the poly sheeting should be placed from downstream to upstream and the next sheet upstream overlapped by at least 3 feet. Overlapping in this direction prevents the current from flowing under the overlap and tearing the poly loose.